LA here we come. My teen girl and I are headed to LA once again to check out potential colleges. She will go off to college in just two short years. Those years will be short…and we will have some long days. Long and challenging days are gonna happen when raising teens who are straddling the fine line between kid and adult. Each year as they approach 18 (and I know as my son is almost 21, so I have lived this once before) we parents have to have faith and let go a little more. We also have to have boundaries, rules and consequences. Consequences that are calm and fair. And when our testy teen gets really testy, we parents must try to forget that we are human and respond in a calm, loving and controlled manner. Not easy. Parenting is not for sissies. And sometimes we parents can’t help but be human and get a little too testy right back with a raised voice or being tempted to give that teen the silent treatment for the next few days as we lick our parental wounds and maybe take their testy teen words personally. The irony is that these testy teens want to do it all on their own…BUT…they do, almost subconsciously, want limits because they want us to keep them safe. Sometimes these years can be hard to endure with a hormonal changing teen who is growing up in an uncertain and crazy world. And good news parents! I have a wonderful survival tool for parents! Two in fact! When I have been pushed to my wit’s end by a testy teen, I first consult with my hubs. He is so good at using humor combined with limits and consequences when our teens break a rule or tell us a fib. We first remember that we were not perfect teens ourselves and that these last few years parenting a teenager may be our most defining years as parents. This is it. Our last few years to get it as right as we can before we send them off into this crazy world. This uncertain world sure seems crazier to me since my own teen years back in the 80s. So back to my tools that my gal pal told me about and these two tools have helped me SO much. The tools are two very helpful books that not only get my teens…but also get the parent! I felt so understood as I read these books. Tools are presented with how to talk calmly to your teen, how to actively listen and translate teen talk and how to really enjoy your kid, while navigating the tricky teen waters. And…Get Out of My Life, but First Could You Drive Me and Cheryl to the Mall? Aren’t those great titles?! And the books are great, too. Since I started reading them, my girl and I are getting along better. 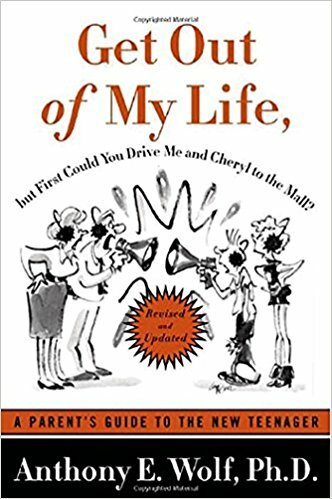 One thing I had to admit, as I read these books, is that I had to change some of my parenting behavior to better understand what my teen is going through with all of the pressures kids face in today’s world. Knock on wood as I have been lucky since my kids have stayed out of the trouble, make good grades, work hard and are focused. But that doesn’t mean that we haven’t had some really hard days, too. The books have given me the tools to help guide both my teen and myself through these incredible years. And both feature chapters for all kinds of challenges that come with these years. These years are priceless. The last few before we become empty nesters. The last few where our beloved kids live under our roof. When one leaves, they are so missed and yet I felt myself so excited for my son’s future and his own excitement that those happy emotions for his future eased my sadness of letting him go. I will do this again in 2020 with her departure. And I will be a full-fledged empty nester. That will be tough. I want to do these last two years right in so many ways. I feel close to both of my kids. I left big careers and put my heart and soul into raising them. And when I worked, I did the same thing as so many parents do to the level of exhaustion. This is our biggest job in a very scary world. It is also a world full of opportunity. It will soon be their world. As the roots are set and we now finish up the wings, these two books have eased the challenging days that are the normal push and pull of the teens growing up…and the parents letting it happen as safely as possible. Here’s to raising teenagers. As the first book I recommended says, these last few years with our kids may be our most defining parenting moments. I am thankful for my excellent partner in my hubs, my amazing parents and in-laws who are an incredible village to my kids, to my gal pals whose ears and a shared bottle of wine remind me that we are all in this together. And to these two books and authors. So awesome to have discovered these helpful books (thanks to my cherished pal, Lizzy for telling me about them). I have read both and I go back to certain chapters when needed. Sometimes when I feel like yelling back at my kid, I pick up these books instead. Almost instantly, I have a better understanding of why my child is so frustrated with whatever the situation is. I get cool down time by reading the book, time to think about my response or future response…and I discover smoother parenting waters. Yes, these books have helped me quite a bit. As I am a hard-working Mama with the best intentions to raise the best adults I can. On most days, I do OK.
And I am human. And on those days, I grab these books or I remember helpful passages from the parenting pages and move forward with those tips on what to do and what not to do. 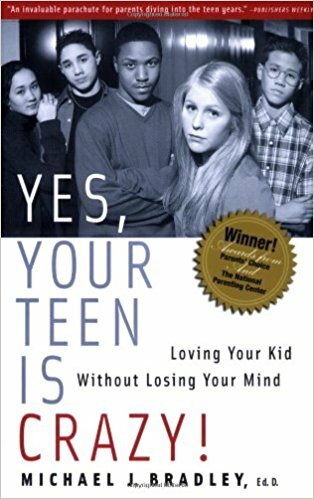 So, if you feel like you need a little extra guidance on lovingly parenting your teen in today’s world, check these two gems out. We are in this together, parents. You truly won’t believe how fast your child, then preteen and then teen becomes an adult. What an amazing job we are given helping them find their way there. My son turns 21 soon. So hard to believe! And yet he is still my little boy in my heart. Two years left to parent my little girl as a teen. I am cherishing the time.